Gary Arndt (born 1969) is an American blogger and photographer. He is the author of the travel blog Everything Everywhere and a former Minneapolis entrepreneur. Arndt was born in Appleton, Wisconsin. He attended Macalester College in the early 1990s, where he was a competitive debater, making it to the late rounds of the Cross Examination Debate Association national tournament in 1990 and 1991. Arndt was a business owner in Minneapolis, Minnesota before he became a writer, starting his first business a few years out of college. He owned the web design firm, Creative Internet Solutions, which he sold in 1999 to Control Data Corporation. While there, he developed the idea to open a video-game playing facility while watching his employees play computer games after work. He owned the videogame salon The Stomping Grounds, with a location in Minneapolis and a second location that opened in 2002. The salon, one of the original PC-gaming rooms in the United States, was founded from the profits Arndt received from a gaming news website he bought in the late 1990s called Stomped.com. The business received about $1 million in revenue during its first year. In March 2007 Arndt sold his house in Eden Prairie, Minnesota in order to travel the world. The initial plan was to travel for about a year and a half, however Arndt decided to continue his travels indefinitely. Since 2007, he has traveled to about 140 countries and all seven continents. Arndt does not maintain a personal residence, living only in temporary locations. He chronicles his journey on his travel blog, Everything Everywhere, which has approximately 100,000 readers monthly. The blog includes both comments on the places he has traveled and photography. He also co-hosts the podcast This Week in Travel and has contributed articles and photography to websites including The Atlantic and The Huffington Post, and The Four Hour Work Week. 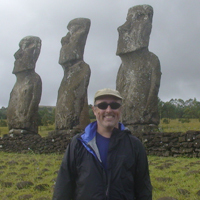 Arndt has won awards from the Society of American Travel Writers and other organizations. In 2010, he was one of 25 selections for Time magazine's best blog list. ^ "A Conversation With Gary Arndt, Blogger and Perpetual Traveler". The Atlantic. 2012-02-27. Retrieved 2015-06-02. ^ a b "These travelers find joy in living in hotels full time". USA Today. 2014-07-21. Retrieved 2015-06-02. ^ "Travel - Forms of identification: Gary Arndt". BBC.com. 2011-04-14. Archived from the original on August 21, 2014. Retrieved 2015-06-02. ^ "Awards - Forensics Program - Macalester College". Macalester.edu. Retrieved 2015-06-02. ^ "A Conversation With Gary Arndt, Blogger and Perpetual Traveler". Theatlantic.com. 2012-02-27. Retrieved 2015-06-02. ^ "I Heart My City: Gary's Minneapolis – Intelligent Travel". Intelligenttravel.nationalgeographic.com. 2011-08-05. Retrieved 2015-06-02. ^ "Cybercafes serve an explosive brew". USA Today. 2002-02-07. Retrieved 2015-06-02. ^ "Battles rage over PC rooms, kids' access to gory games - Page 2 - tribunedigital-chicagotribune". Articles.chicagotribune.com. 2002-09-09. Retrieved 2015-06-02. ^ "Computer game center seeks expansion". St. Paul Business Journal. 2001-11-11. Retrieved 2015-06-02. ^ "Everything Everywhere with Top Travel Blogger Gary Arndt". Pretraveller.com. 2014-02-02. Retrieved 2015-06-02. ^ Davidson, Nick (2012-04-26). "Everything, Everywhere". Outsideonline.com. Retrieved 2015-06-02. ^ "Apple, strikes and Bangkok - guest appearance on This Week in Travel podcast". Tnooz.com. 2010-05-29. Retrieved 2015-06-02. ^ "7 Reasons Why the 'Authentic' Travel Experience Is a Myth". The Atlantic. 2011-09-18. Retrieved 2015-06-02. ^ Gary Arndt (2011-02-21). "All I Really Need to Know I Learned From Traveling Around the World". The Huffington Post. Retrieved 2015-06-02. ^ Ferriss, Tim. "20 Things I've Learned From Traveling Around the World for Three Years | The Blog of Author Tim Ferriss". Fourhourworkweek.com. Retrieved 2015-06-02. ^ "2014 SATW Bill Muster Photo Competition". Satw.org. Archived from the original on 2015-06-08. Retrieved 2015-06-02. ^ "2014 Central States Writing and Photography Winners | SATW Central States Chapter". Satw.org. Archived from the original on 2015-02-07. Retrieved 2015-06-02. ^ "2012 Writing/Photo Contest Winners | SATW Central States Chapter". Satw.org. Retrieved 2015-06-02. ^ "2013 NATJA Award Winners". NATJA.org. Archived from the original on 2015-04-29. Retrieved 2015-06-02. ^ James, Steven (2010-06-28). "Everything Everywhere - Best Blogs of 2010". TIM.comE. Retrieved 2015-06-02.